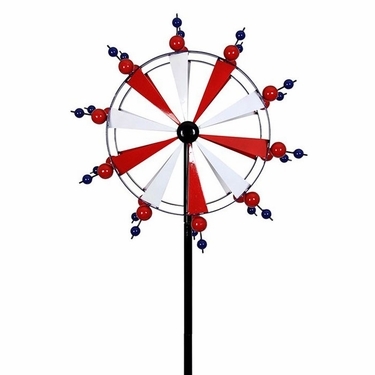 Our brand new 75" Giant Patriotic Pinwheel Wind Spinner will dazzle you and your family as it spins beautifully before your eyes. Constructed with stainless-steel ball bearings, this all metal design wind spinner will add the perfect touch of youthful charm and pride in our nation. Painted with vibrant metallic paints in shades of red, white and blue, it will shine in the sun and sparkle as it spins. It comes with a firm 4-prong pitch stake bottom for extra stability so it will continue standing tall and proud in its garden home. Size: 24" x 9" x 75"H, Metal.